Julia Olson, chief legal counsel of Our Children's Trust, is helping 21 young people sue President Obama and the federal government over insufficient action on climate change. But to understand why this legal action is so critical, and what's driving her to bring the case against tough odds, you need to meet Olson in 2006, eight months pregnant, and looking for shelter from the late-summer sun. "It was August and it was hot," she told me. "I remember the heat." Olson, now 45, sought refuge in an old-timey Oregon movie theater. The film playing was "An Inconvenient Truth," which outlines the perils of climate change -- the storms and fires and floods and droughts we've seen all summer. By then, Olson was an experienced environmental attorney. She knew the basics of climate science, that we humans are heating up the planet at a rate that scares scientists, primarily by burning fossil fuels and chopping down rainforests. She got it intellectually. But while she watched the documentary she thought about the baby boy in her womb. Would the world be safe? Would it even be livable? "I cried through most of the film," she told me. "It was very powerful to be carrying new life within me ... and to see what I was bringing my child into, and to have it so visually in my face." "It's such a human instinct to bring life into the world and raise children," she added, "and now there's this added responsibility of 'I'm bringing them into the world and I'm also leaving them with this planet that may not be safe for them.' It's a big responsibility for a parent. And I want more parents to feel that weight of responsibility for the planet and the country that they will leave their children. I really want our presidents and our politicians and our leaders, people within the departments of the federal government -- and judges -- to feel that weight." On Tuesday, Olson will try to get US District Judge Ann Aiken, a Bill Clinton appointee, to feel the weight of the court's responsibility to do what other branches of government so far have failed to do: Create a national plan to get greenhouse gas emissions to levels that scientists consider safe. She's bringing the suit on behalf of 21 young people because children have more to lose with climate change than adults. They'll be living the climate-changed future we all should fear. These climate kids can't vote. They have no voice in politics. Yet, sitting in the front row of federal court, wearing ill-fitting suits and doodling during the arguments, they will be seen. And Olson will attempt to make them heard. "It's as if the children really speak through her," said Mary Wood, faculty director of the Environmental and Natural Resources Law Center at the University of Oregon. Some legal scholars consider the climate kids' case to be a long shot. Olson will argue that the federal government, by failing to adequately regulate greenhouse gas pollution and by continuing to lease new federal lands and waters for fossil fuel extraction, as recently as this year, is violating the kids' constitutional right to life, liberty and property. (Warming is causing the seas to rise, for example, and one plaintiff lives in coastal Florida). She'll also claim that children are a class that's being discriminated against when it comes to climate change: They're not causing this problem, and yet they will be disproportionately subjected to its dire consequences. In a March hearing, the federal government and an attorney representing fossil fuel interests asked another federal judge, Thomas Coffin, to dismiss the case before trial. "No court has ever found a fundamental right to be free from climate change," Sean Duffy, an attorney for the US Department of Justice, said at the March hearing. "There is simply no constitutional right to a pollution-free environment." The federal government isn't responsible for all the climate pollution in the world, he said. Furthermore, "federal courts are not a proper forum in which to raise generalized grievances about federal policies." Duffy said he was not authorized to do interviews about this case. It was telling that the fossil fuel industry argued right alongside him. Quin Sorenson, an attorney representing industry and fossil fuel interests, told the judge that the case should be thrown out because the it alleges harmful inaction rather than action. "There is no violation of a statute. There is no regulatory relief that has been denied. It is simply that government has failed to do what these plaintiffs think they should do," he told the court. Despite these arguments, however, Judge Coffin recommended the case move to trial. At the Tuesday hearing here in Eugene, Oregon, Judge Aiken will review that decision and issue a final recommendation. Olson's heartfelt plea -- one based on legal expertise and also her experience as the mother of two young boys -- may be what helps propel this long-shot case. "The planet is on the docket," Wood, the University of Oregon professor, told me. "This is the biggest case on the planet." It's a case that Olson, in some ways, has been prepping for her entire life. She grew up in Colorado Springs, Colorado, the older of two siblings. Her mother is a nurse and outdoor enthusiast who, at age 66, is still teaching wilderness survival classes. She instilled in Olson a sense of nurturing, of taking care of other people and the natural world. "She had us climbing 13,000- and 14,000-foot mountains at (age) 5 or 6," Olson told me. "I love to be on top of a high peak," she said, "and the journey up there." The baby she was carrying when she watched "An Inconvenient Truth" is now a 9-year-old boy named Bay. Talk to Olson's colleagues and advisers and they'll tell you that, of course, she's bringing this lawsuit against the Obama administration for children around the world, including those who haven't been born. But she's also bringing it for Bay. "Julia's not just a lawyer with kids," said Timothy Ingalsbee, father of Kelsey Juliana, one of the plaintiffs in the federal court case. "She's a mother practicing law." "She has humility and she's also got confidence," said Wood. "She's a brilliant strategist and litigator." At home, Olson has the gentle demeanor of a yoga teacher. When we met, she was wearing a "Live Simply" T-shirt, an argyle sweater and wool clogs with a hole at the big toe. In court, though, and wearing a suit, she has a quiet intensity about her. "Many attorneys have egos," said Wood. "She certainly does not. It's why she's so moving. "She gets herself into the reality these children face and she conveys that reality to the judge." After the film in 2006, Olson knew she wanted to work on something big to try to protect Bay and his older brother, Tayo, who is now 12. It took years for that idea to become Our Children's Trust, the non-profit Olson founded in 2010 to bring these sorts of cases to court. The idea to let children front these lawsuits came out of conversations between Olson and James Hansen, one of the world's most respected climate scientists. 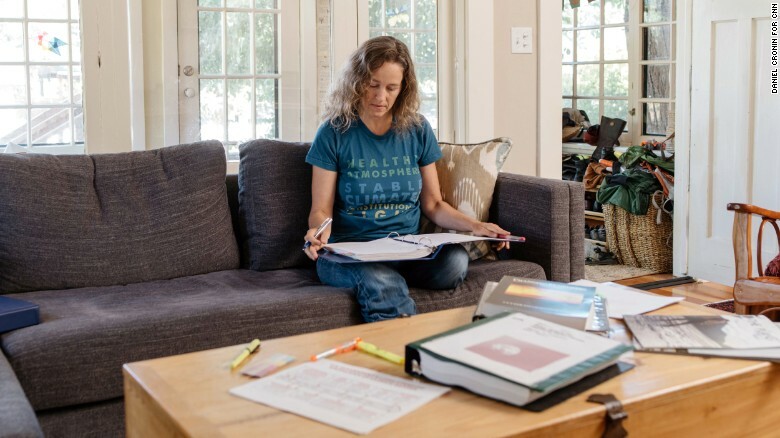 She'd read Hansen's book, "Storms of my Grandchildren," (Hansen's granddaughter, Sophie, is one of the plaintiffs) and she'd learned of an attorney in the Philippines who'd brought environmental lawsuits on behalf of kids. Hansen introduced Olson to Alec Loorz, who would become the first child plaintiff. "When we started this, Julia was not handed anything on a platter," said Philip Gregory, co-lead counsel on the case in federal court. "She had to create this from scratch." It was important to Olson that the kids all volunteered to participate -- and that this was really their movement, not hers. I've spoken to most of the child plaintiffs in the federal case, and it's clear to me that they want to be involved in this case. Some had to convince their parents to let them sue Obama and the federal government. Many were already environmental activists before they heard about this lawsuit. And they're better versed in climate policy than most adults you'll meet. By Mother's Day 2011, Our Children's Trust had prepared to file climate lawsuits in 50 states -- as well as a federal case in Washington, D.C. -- on behalf of young people. It seemed like David might beat Goliath. It wasn't long before Olson and Our Children's Trust started suffering defeats. Some state cases didn't go far. And the federal case they'd filed with Loorz, which argued that the atmosphere was a "public trust" that the government had a duty to protect, was tossed out of court after a US Supreme Court decision was interpreted to limit the scope of public trust law to states. "There were times when it was extremely discouraging," Gregory told me. But the team came up with a new strategy. They would try the federal courts again, this time in Oregon, and make broad constitutional claims about the threats that climate change will pose to young people. The federal case in Oregon isn't the only case Our Children's Trust is working on. But it's by far the biggest -- and the one with the most emissions at stake. Olson feels the weight of it. Her barn-red home here in Eugene is littered with binders, pens and highlighters. On a chalkboard in the kitchen, there's a poem from nature writer Wendell Berry. Olson told me that if you allow yourself to feel the gravity of climate science -- the fact that coasts will be submerged, forests burned, snowpack melted -- it's easy to despair so much that you become paralyzed. She told me there are days when she wants to crawl into her bed -- or into a tent in the mountains -- and make the world and its problems disappear. She never does, though. Or not for long. "I can't do that," she said, "because I have to look my kids in the eyes." Maybe this all sounds alarmist to you. If so, Olson would encourage you to look at the science and consider something: What if all the world's scientists are right and you are wrong? Climate change has dramatic "tipping points" built into it. If we melt the Greenland ice sheet, for example, we can expect the seas to rise 7 meters, or 21 feet. Cities like New York and Hong Kong could become unviable. Deadly storms are expected to get stronger. People will be displaced from homes not just in the Arctic, where this is already happening, but along many coastlines in the United States. Droughts will make farming some crops more difficult. Wildfires already are intensifying. Each of the 21 plaintiffs in Olson's case represents these threats in one way or another. Jayden Foytlin, 13, told the court in a recent declaration that her family's home in Rayne, Louisiana, was flooded in the recent storms there. "When I stepped out of my bed, I stepped in water that came up to my ankles," she told the court. "I stepped right in the middle of climate change." Those floods have been linked to human-caused warming. This is happening now, and it's only poised to get worse. Olson and her team are asking the federal court in Oregon to order the US government to create a comprehensive plan to help lower global carbon dioxide levels to 350 parts per million, which they claim is what the government's own scientists recommended in 1990. (That metric is also widely regarded as being "safe" from dangerous warming). With every year that passes, attaining the goal becomes more difficult. While Obama should be credited for addressing climate change like no other US president has, it's clear he and Congress -- especially Congress -- have not done enough. In December, he signed the landmark Paris Agreement on climate change, a move I applauded. And he proposed the Clean Power Plan, which could help move the country away from coal, arguably the dirtiest fuel. But that move has been stayed by the US Supreme Court. The science calls for a near-abandonment of fossil fuels this century to avert runaway warming. Despite laudable efforts, we simply are not on that path. Our Children's Trust hopes this litigation could have the same effect as landmark Civil Rights cases -- that it will push the government to act far more swiftly than it would be willing or able to on its own. Essentially, the attorneys are arguing the US government needs a parent. "Every year that we've been working on this is another year of emissions that have been building up and locking in more heating," Olson told me. "We're already at 1 degree Celsius of warming. When I started this work we were at 0.8. The current projections are within eight years we will be at 1.5 and in less than 30 (years) we'll be at 2 degree Celsius. "Humans have never lived on a planet that was 2 degrees Celsius warmer than it was before we started burning fossil fuels. Every scientist I know says that's catastrophic." Even if the world meets the terms of the Paris Agreement, scientists expect 2.7 degrees Celsius of warming by 2100, far more than the agreement calls for, which is 1.5 to 2 degrees. "We don't have time," she said. Olson's boys know some of what their mom does for work. But she hasn't let them see "An Inconvenient Truth." She's worried it would scare them -- that they might feel hopeless. When they ask about climate change, she tells them, "I'm taking care of this, I'm going to fix this." "They probably feel like mom's got their back," she told me. (Olson declined to let her children be interviewed for this article). I told her that must feel like an incredible burden -- telling your child you're going to "take care" of climate change for them. What does it feel like to say that? "I have to cry ... or I'm going to cry in court," she said, smiling through watery eyes. "It's when I talk about my kids and being a mom that I just lose it." I'm not a parent, but all of us know children who we care about deeply. What makes Olson's argument so powerful is that it's tapping into what Wood, the law professor, calls a "primal urge" to protect young people. Imagine seeing a child floating down a river and struggling to swim, Wood told me. You only have a certain amount of time to act before the child is gone. Do you dive in now or do you wait? At what point do you try to throw the kid a rope? We too rarely treat climate change with the same urgency she does. It's too easy to pretend this is a distant disaster, one we won't experience. We're writing off future generations. People "have a hard time staying present in the trauma of it," she told me. "You can't work through trauma unless you're willing to stay in it -- and feel it." Near the end of my interview with Olson, she outlined for me (and an independent documentary film crew) her fears about the world in which her children could grow up. They'll ride their bikes around town, sure. And they've been known already to refuse plastic straws and toys with unnecessary packaging. But she knows system-level changes are needed. "They are going to live in a very different world than I did, and I hope we can stop as much of the devastating changes as possible, but they're going to need tools of how to live in community and depend on people ... and find ways to deal with the catastrophes that will come ..."
She broke into tears again. Then she looked up at us. "How come the rest of you aren't crying?" John D. Sutter is a columnist for CNN Opinion who focuses on climate change and social justice. Follow him on Snapchat, Facebook and email. The opinions expressed in this commentary are his.